Ah, what to buy that traveler who has everything? Paper shaving cream sheets? Cool, but no. How about a pair of sandals with a built-in flask? Clever, but what kind of message does that send? An REI gift card? Nah, too predictable. How about a kangaroo scrotum bottle opener? Bingo! Now we’re talkin’. 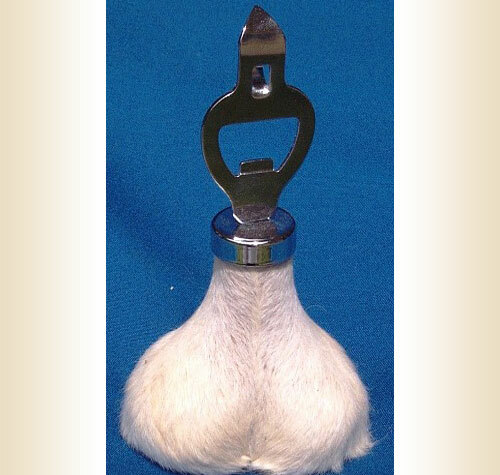 Nothing says “Why yes, I am well-traveled!” like … well … a pair of hairy marsupial balls attached to a bottle opener. I’d like to inject some witty and humorous remarks about this lovely gift, but it’s far easier to let the sellers speak for themselves. This, is a genuine kangaroo scrotum folks, if you click on the picture to enlarge it you’ll notice an abundance of hair… yes, the kangaroo has hairy balls too! So the key to judging a kangaroo scrotum’s authenticity is the hair? Good tip. I thought I noticed something fishy about all those hairless, black market ‘roo scrotums I’ve been seeing in the backalleys of New York City. Through this harvesting program we are able to make available to you the famous kangaroo scrotum, intricately handcrafted into a useful bar tool – the bottle opener! But who was the first person to make the connection between scrotum and “useful bar tool”. That’s a bit of an odd leap, no? Kangaroo Scrotum Bottle Openers are extremely popular as a functional bar decoration throughout the world. Great gift for the macho guy who thinks he has everything. Any Aussies out there want to chime in about this? Are these really world famous? I did a little work as a kangaroo shooter and picked up hundreds of the things by their scrotums. They’re nature’s perfect handle. While the rock wallaby is protected in Australia, the Big Reds aren’t, and they can do hundreds of thousands of dollars in crop damage in a single night. nowhere near as popular as cane-toad wallets and purses. A truely unique gift for travel. A great talking piece at any get together with your mates and family. Really, it is beautiful kangaroo scrotum bottle opener.